If you’re like us, you watch infomercials with a heavy dose of skepticism. Most of the stuff “as seen on TV” is cheap garbage, and not worth your money. But after seeing the ad for the Red Copper Pan, we couldn’t help but wonder if there was any weight to their claims. 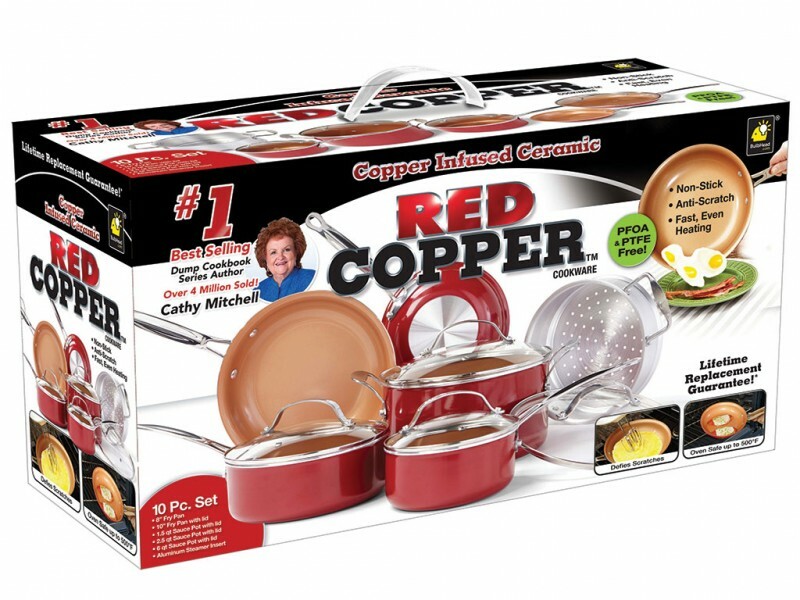 We decided to test out the red copper pan for ourselves to find out the truth. Does this pan actually perform any better than a standard non-stick Teflon pan? We decided to put it to the test to get some real world results. The ad for the saucepan looks literally unbelievable. They can burn almost anything on the surface and it just slips right off. Burnt cheese slips off like it wasn’t even cooked on it. How many times have you made a cheesy dish like pasta and it wreaks havoc on your scouring pad when trying to clean it? Burnt sugar slides off the surface like nothing. It’s actually really impressive. But we all know that these made-for-tv ads tend to showcase a product in the best possible light, so we had to use our real tests to get a final verdict. But first, lets take a look at the basic specifications. There are numerous sizes and models available, and you can check out the full line here. Below we have outlined the most popular options you can get your hands on. 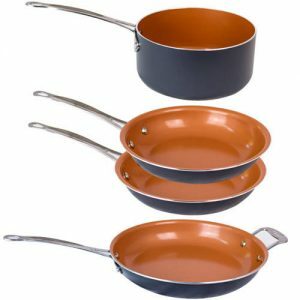 If you’re looking to convert your entire kitchen to these unique copper pans, the 10-piece set is the ultimate package. 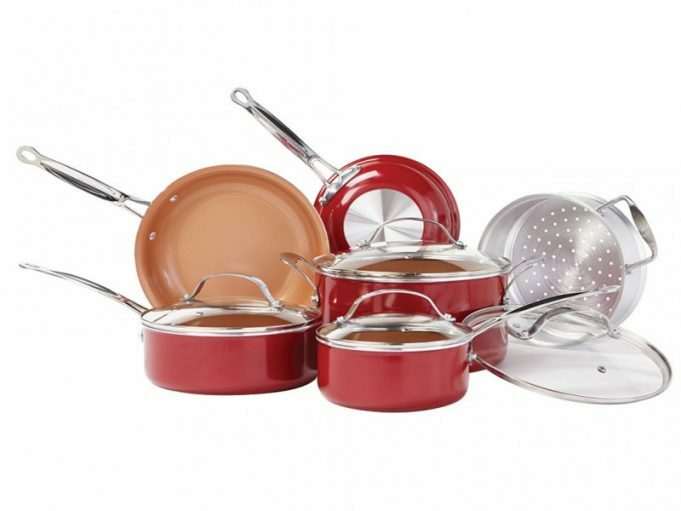 On a pan-per-pan basis, this set is about 40% cheaper than if you were to buy each pan individually. This is the largest pan of the bunch, and our personal favorite. It’s got a very comfortable and ergonomic handle, and has the same excellent build quality as the rest of the products in this set. It’s large enough to cook for a family of 6, but flexible enough to cook a one-pot meal for anyone who’s eating solo. This package also includes the lid, which is typically sold separately. this compact fry pan is the original offering that obtained so many positive reviews. It’s much more compact than the 10-inch model, making it the perfect accessory when you’re cooking a full size meal. The smaller pan is best for cooking things that typically make a mess. Bacon, cheese, sugar, or other fatty foods that tend to bake on will just wipe right off with this model. Like the 10-inch version, this one also includes the lid. 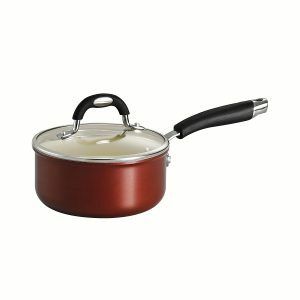 Whether you’re making soup or just whipping up a sauce for the rest of your meal, this compact sauce pot is among the best on the market. This unique non-stick surface is perfect for fatty foods that have a tendancy to stick to the bottom. You won’t need any oils or cooking spray, and cleanup is as simple as just wiping the pot out when you’re done. This is the middle sized sauce pot with a variety of potential uses. It’s got a large 10-inch size with a flat, shallow bottom. 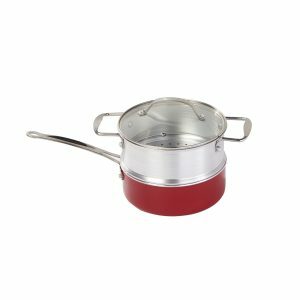 This allows it to be used as both a pan or a pot, depending on your needs. While many of us already have a pot like this at home, our opinion is that this is the most versatile of the bunch. 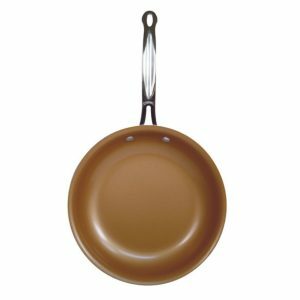 It’s shallow design means that it could be used as a frying pan for burgers or vegetables, but you can also cook soups or other liquid foods. 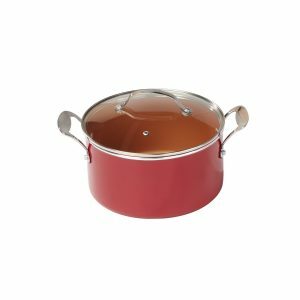 This is the biggest of the bunch, perfect for cooking pasta or large stews. We’ve found that this sauce pot really changed the way we cook. When boiling pasta, we just add the sauce right to the pasta instead of using a separate pot. Because it won’t burn on, you don’t have to worry about cleanup. It’s also oven safe to 500 degrees, so you can simply throw it in the oven if you want to create a baked meal. No more baking sheets! The steamer tray is fairly basic in design. It’s supposed to go with the 2.5 quart pot, enabling you to steam vegetables. But we’ve also found that it’s useful as a pasta strainer. Because it’s aluminum, it cooks off very quickly making it easy to wash. It doesn’t have the same non-stick surface as the other items, but these items don’t typically get very dirty. 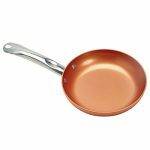 The main draw to the red copper pan is simplicity. Consumers want something that is easy to use and easy to clean. By taking your mind away from the mechanics of cooking, you can focus on what’s important – your food. This square pan is the largest of the bunch, featuring a premium double coating. This makes the pan ideal for preparing food with a long cook time, as the second layer helps prevent that ‘baked on’ layer that tends to accumulate. 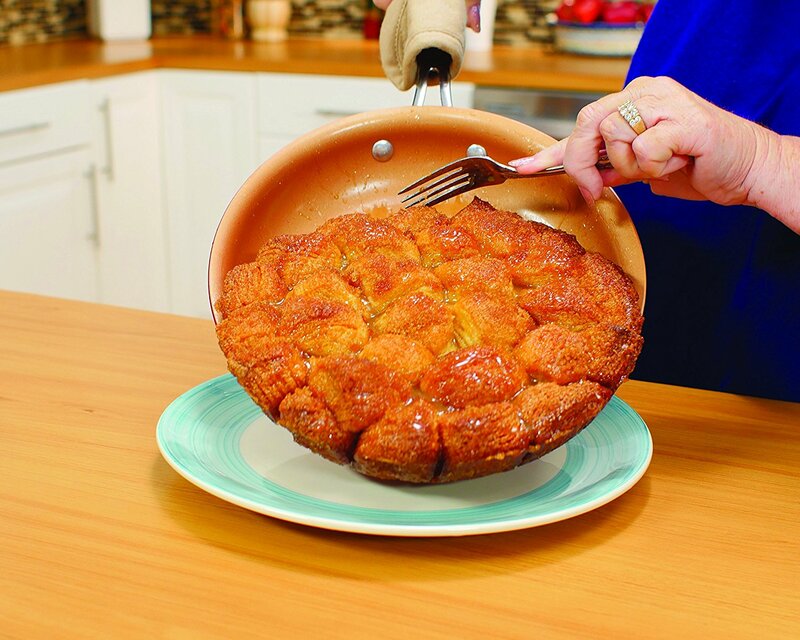 This pan is completely oven safe up to 500 degrees, so it can absolutely replace your casserole dish or any other oven safe cookware you have around the house. This is being sold as the “jack of all trades” kit, implying that it really can do anything! But does it hold up in the real world? We decided to find out. First: What you get in the box. It comes with one very large square pan, which we think of more like a pot. It’s wide and deep, and we could see ourselves cooking anything from lasagna to shepards pie inside. That being said, it’s got a nice flat bottom, so you could easily fry up a burger if you wanted too. The rest of the kit is all accessories for the pan. You get a large steaming tray for steaming vegetables. Because of the depth of the pot, this tray would be great for anything that you have to steam for a long time. It can hold a lot of water volume, so you won’t be boiling it dry. You also get a large mesh basket for deep frying – a great way to make those home-cooked fries. Finally, you get a lid and a cookbook. Overall the pan worked great. We prepared plenty of food and, as usual, cleanup was a breeze. However, there were a few downsides to the pan as well. Our main complaint comes from the way the package is sold. Although it’s a five piece set, it’s really just a pan with two accessories. The steamer and the basket are both very useful, but claiming that the lid is a whole separate bonus doesn’t make much sense. Additionally, the included cookbook wasn’t particularly high quality. There were some good basic recipes in there, but you’re probably not going to learn any new tricks. As for the performance of the copper non-stick coating, it was great as usual. We do question the value of the dual coating. The performance was fantastic, but not measurably better than the other pans in the kit. 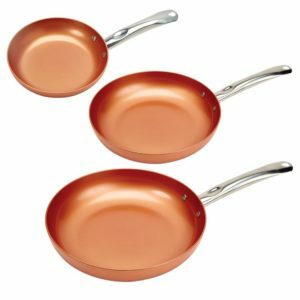 When the red copper pan first came out, the only round pan they sold was a 10” model. While this is great for smaller meals, a 12 inch pan really is the sweet spot. There is nothing stopping you from placing a little bit of food in a large pan, but you certainly can’t make a smaller pan bigger. For this reason, the 12 inch pan is our top choice from the entire red copper lineup. The whole pan has a very premium feel to it. The handle has just enough heft to it to feel solid, but not so much that it feels bulky. It’s slightly rounded giving it an ergonomic feel, and the “helper handle” on the front makes it easy to lift. One of the nicest things about these handles is that they don’t wick heat from the pan. Even when it’s been sitting on your stove for an hour, you can still pick it up bare-handed.This pan is oven-safe, allowing you to use it at temperatures up to 500 degrees. While it’s a little unorthodox to use a pan for baking, this is one of the few that will work perfectly. No matter how you choose to cook your food, the biggest advantage to this pan is it’s non-stick coating. Made from ceramic infused with (you guessed it!) 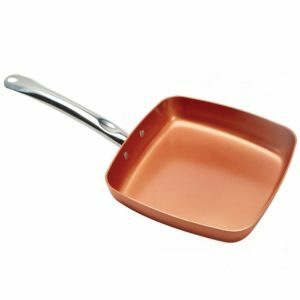 copper, this is one of the few pans that you can cook virtually anything without a difficult cleanup. Even if you seriously burn your food, this pan simply wipes off with nothing more than a simple cloth. You don’t have to use oils or greases, allowing you to cook healthier food. Who doesn’t love Paninis? Philly Cheesesteak? If you’re a sandwich fan, the Flipwich was designed just for you. 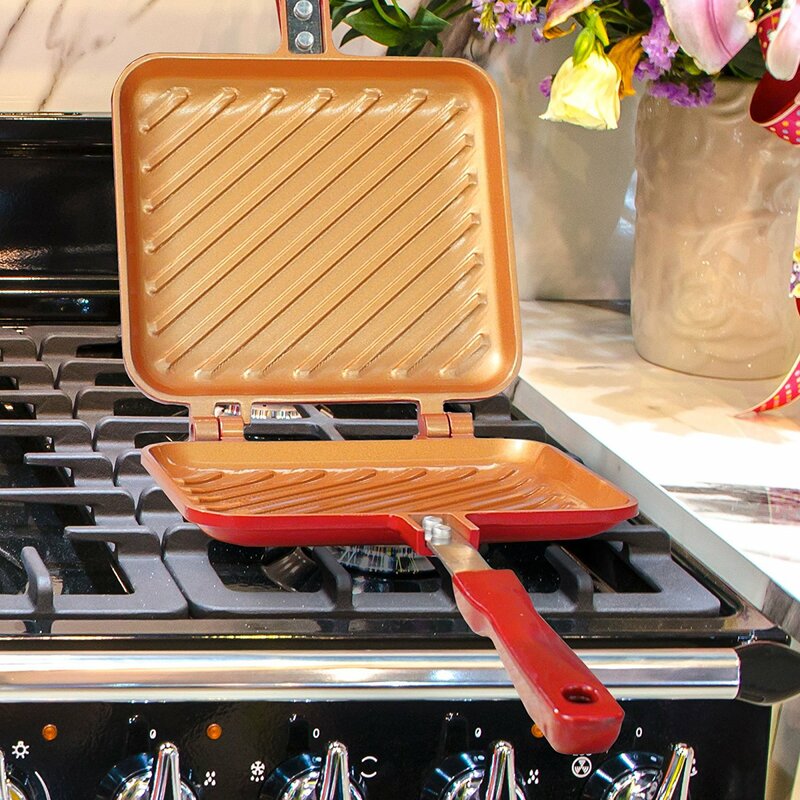 Featuring the same non-stick coating of other red copper products, this unique design features a two-piece cooking surface that helps you cook your food evenly on both sides. Using it is fairly straight forward. Pick it up by the handle and place it on your cooking surface. There is a small metal clip on the handle that allows you to lift the upper portion, separating the two cooking surfaces. Thanks to the non-stick coating, you won’t need to use any oils or butter. For this reason, some could argue that the flipwich is the healthier choice for Panini makers. That being said, there are some circumstances where you want to use butter. In our case, we’ve always been a fan of mixing garlic with margarine to give a little extra seasoning to our bread. In this case, the choice is yours. Once you’ve prepared your sandwich the way you like, simply throw it on the pan and close the lid, taking care to lock the handle once again. Cook it half way on one side, then flip it over to grill the other side. Once you’re done, you’ve got a perfectly cooked Panini without having to use an expensive sandwich press. Compared to the other pans we looked at, the flipwich is one of the better built models. The handle is much more rigid, and the aluminum base is a little thicker. It’s got a bit of heft to it, and the build quality feels excellent. Just to experiment, we tried cooking some other things in the flipwich. We grilled up some sausages, as well as some burger patties. Typically, you wouldn’t want to cook a cheeseburger in a dual-sided pan like this, as the cheese will stick everywhere. But in our tests, we found that the top peels right off without pulling your cheese apart. This could also be used for steak, or any other meat that you want those BBQ-style grill lines, while still using a non-stick pan. The few minor issues we had with the other red copper pans stands true here. Although the infomercial shows that the surface is incredibly durable, we found it to have the same level of durability as other non-stick pans. If you use plastic utensils, you won’t have any problems. But metal utensils do have the potential to scratch the non-stick surface, damaging your pan. We’ve used metal spatulas many times without causing damage, but you do need to make a note to be careful. Realistically, the best bet is just to use cooking utensils that are safe for non-stick pans. Just like all of the other options, the flipwich is PFOA and PFTE free. One of the biggest issues that we had with steel pans was rust. 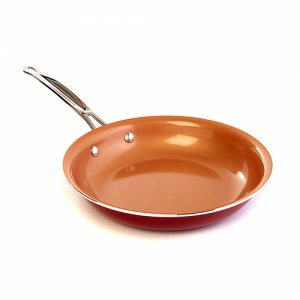 If you scratch the non-stick coating, the pan can quickly start to get surface rust and will become useless. But this pan is made from aluminum, so rust isn’t an issue you have to worry about. While this option isn’t quite as versatile as some of the other pans, it fills a unique niche that many consumers will be very happy about. The surface is composed of a ceramic-infused copper compound, which sounds a little far-fetched, but clearly it works. Ceramic has been well-known to be a superior cooking material for a ages, so we figure just throwing some copper in the mix there was the missing link. Whatever the surface is made of, it’s got no nasty toxic chemicals, and is PFOA and PTFE-free – two toxic chemicals that have moderate, but well-known long term effects. Ceramic itself is known to be safe. it’s already been used on a variety of baking dishes for decades, and scientists have found no known hazards associated with the material. But what about copper? On it’s own, there are some hazards associated with 100% copper cookware. Acidic foods such as tomatoes can leech the metal from the material, which then makes its way into your food. Fortunately, you’d need a LOT of exposure to copper before you saw any negative health effects. However, this issue isn’t present with something like the red copper pan. 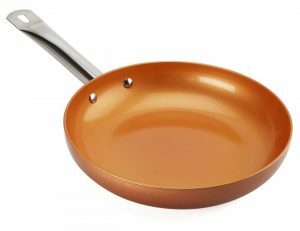 The surface of the pan itself doesn’t actually contain any copper. it’s blended into the lower layers below the ceramic coating. This means that the pan is 100% safe, but only if you use it correctly. You shouldn’t use any scouring pads on the pan, and you should avoid scratching the surface with hard metal objects. Luckily, the pan shouldn’t require cleaning in this way. As you can see from that video, you can cook an egg with no butter or oil and it just slides around on the pan – perfect “emoji” eggs every time. In the video above they go on to do cheese and sugar with the same result – no sticking, and barely any clean-up. This applies to all kinds of foods. Simpler options like eggs or bacon are a breeze to cook, while ‘messier’ foods like fried cheese and even burned sugar don’t seem to stick at all. You may need to wipe up any leftovers with a paper towel or cloth, though. Low-carb diets are all the rage these days like the ketogenic diet. This would be great for a keto or other low-carb diet to make paleo taco shells made from fried cheese. 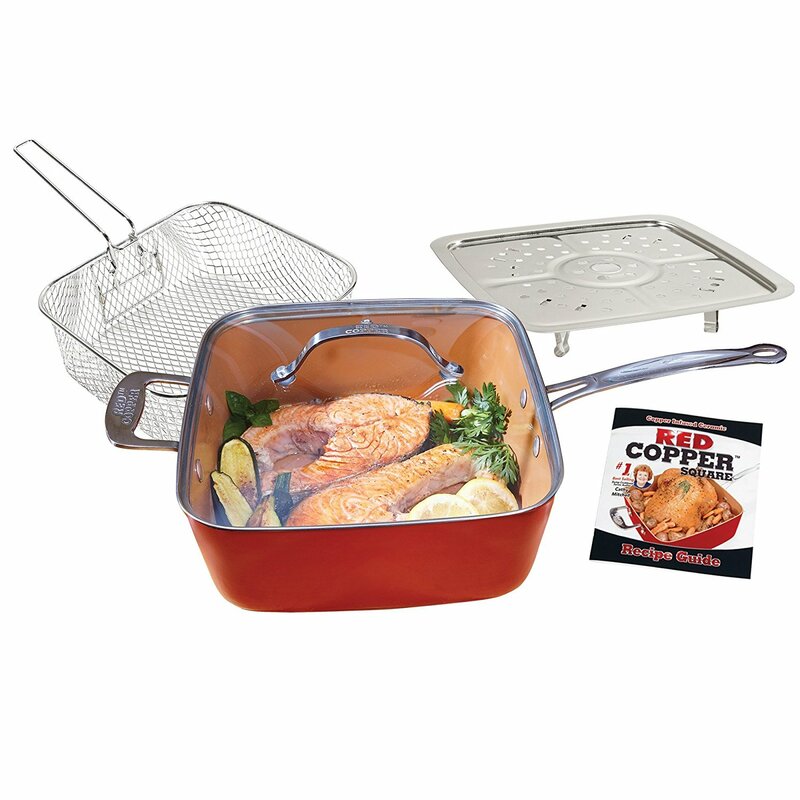 This was just one of the many exciting ideas we had when doing this Red Copper Pan Review. Another awesome feature of the saucepan is that it’s safe up to 500 degrees Celsius, and because the handle is metal and not plastic, you can use it in the oven. Some of the . meals we cook, we like to start on stove top, like giving meat a good sear for example then put it in the oven after to finish it off, so the Red Copper Pan is great for that. They also make larger pots that may be better than the shallow saucepan for this sort of use. One claim that the infomercial makes that just doesn’t stack up is that the skillet is supposedly anti-scratch. But, you can absolutely destroy the cooking surface so you NEED to make sure you are using plastic/teflon utensils when cooking with the Red Copper Pan to make sure you don’t ruin the surface and make it last. 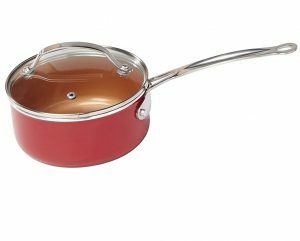 If you want to make the most of your red copper pan, you should treat it just like any other non-stick pan. This means don’t use metal cookwear, and use caution when sticking forks or spoons into the pan. You should also try to avoid using a very abrasive scouring pad or sponge when cleaning it. Or, just throw it in the dishwasher. Despite this one issue, it still holds up a lot better when compared with traditional non-stick pans. Click here to see how it stacks up in terms of durability. 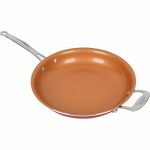 In order to maintain the impressive non-stick properties, you do need to “season” the pan, similar to a cast-iron pan, as per the manufacturer’s instructions. All you need to do is to coat the cooking surface of the pan with olive oil or other vegetable oil, and place in a 300F oven for 20 minutes. It is also suggested you do this every 6 months to ensure that you maintain the smooth cooking surface. The vast majority of negative reviews are from people who neglected to care for it properly in this way. We were worried at first that maybe the cooking surface would wear off over time, but even after a few months with proper care, the surface maintains its non-stick properties. At the end of the day, we typically prefer to use cast-iron or stainless steel cookware for most of our day-to-day cooking. The crust (fond) that develops on these pans has so much flavour and gives you the option to deglaze the pan and make sauces. And having a well-seasoned cast iron skillet is awesome (though that’s a post for another day). That being said, this is a great cooking surface for certain things. It’s the absolute best kitchen tool for making fried eggs with, hands down. No oil, no butter, not nothing and you get a perfect fried egg every time. It’s also great for things like caramel or cheesy dishes. The surface will continue performing as long as you don’t use metal utensils on it. Overall, it’s a surprisingly great frypan for a decent price. We took an in-depth look at this unique anti-stick technology, and went in-depth exploring the different products and packages available. If you own this pan yourself, let us know in the comments what you think. We love to hear feedback from consumers, and we’ll update this review with any new information that comes available.